Affiliate Links: If you click a link below, I may receive small credit. I pay for this subscription. So, I wasn’t planning on purchasing a tote from Golden Tote this month, but I did. I know, for shame. I was planning on being so good this month, but like always, clothes happened. Oops. Anyways, if you’re new to Golden Tote, it’s a non-subscription mystery clothing grab bag. You pick 2 items for $149 and receive 4-5 bonus “surprise” items, or pick 1 item for $49 and receive 1-2 bonus “surprise” items. Each tote is curated by a stylist based on a style profile. Don’t like everything you receive? While you can’t return individual items, you can trade or sell them on the special trading group on Facebook. Don’t like anything? Send it all back for a refund. So, what did I pick and receive in this month’s tote? Let’s check it out! Kind of obsessed with this dress already. I wore it this weekend to the fair when we were on the coast and it was perfection with my military jacket and sandals. I like that this will be easy to wear this fall with sweaters, jackets, and boots. We’re attending a couple of weddings this fall in warmer climates. The color of this dress screamed Miami to me (where one of the weddings is) so I had to have it. Sorry not sorry. It’s a little big for me, but honeslty, I kind of like it that way. I may try to shrink it a bit, as it is made from a cotton blend. Out of the box I loved this. On, not so much. There’s nothing wrong with the dress, but sadly it’s too tight in the chest and thus across the upper back and shoulders. Sadly, this will have to be traded. 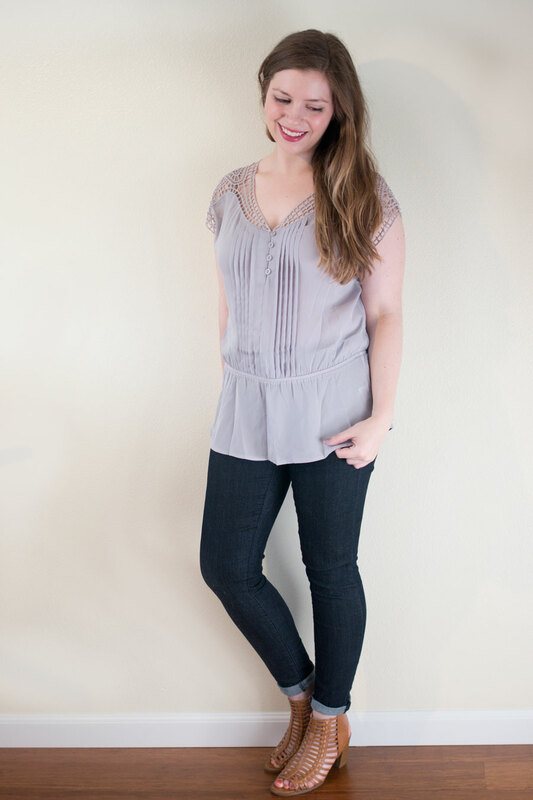 I absolutely love the detail on the shoulder and the buttons down the center… however, in my profile I’ve listed no drop waisted items which this definitely is. Unfortunately, I don’t find them flattering for my shape so this will be traded too. Out of the box I really liked this. To me, this screams fall and I definitely am ready to bust out the fall tops. Sadly, when I looked at the pictures of this, I just wasn’t in love with it. I feel like the sweater cuts me at an unfortunate point (not quite cropped and not quite long enough) so I think this would work better for someone a little taller than I, so off to trade this one too. Loveeee this. I was unsure opening the box how I would feel about this since it looked awfully large, but I love this with bright shorts while it’s still warm and will go well with jeggings and boots come fall. 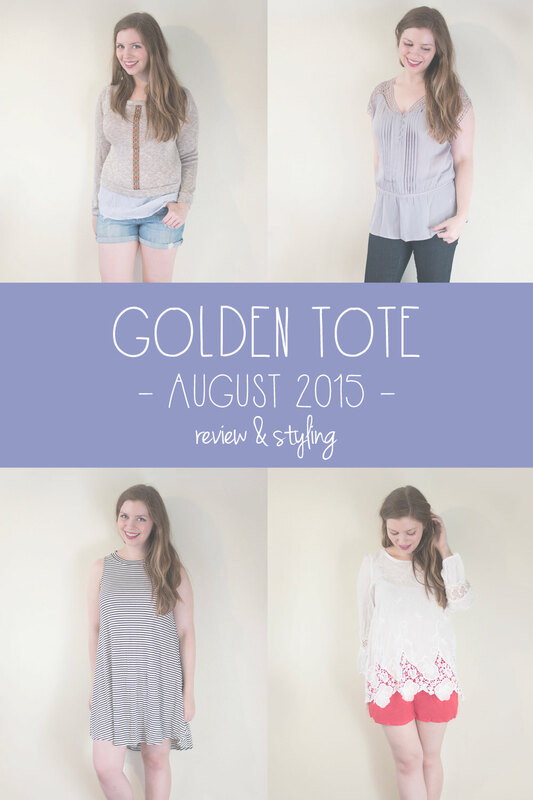 Overall, I thought Golden Tote did a good job this month of sending me items that are my style. Unfortunately, the issue was mostly due to sizing, and with following my profile requests. Because I’m a big fan of my two chosen items and the Potter’s Pot white top, I will be keeping my tote. Would I try Golden Tote again? Yes. I think the experience is fun and overall is a good value. Six pieces for $149 is a great deal, and I’ve never had an issue selling or trading for something I liked more. Have you tried Golden Tote before? What do you think about the items I received? Eeee! I’m planning on getting a tote next month after we move and have an address. OBSESSING over the swing dress, it it the perfect summer-fall transition piece! I love that first dress! So fun! It’s too bad the Orange Creek dress didn’t fit…I think it’s so cute! I really like it too, so I may just end up keeping it! That trapeze dress looks so cute and comfy! Those are my favorite kind of dresses–you can just throw on! This is a great box. I mean, I personally would wear most of this stuff, which is rare for what you (specifically you, I think you’re the only person I follow who does reveals on subscription clothing boxes) are usually sent in these boxes. The last two tops aren’t my favorite, but everything else is right up my alley. Agreed, I was thrilled with this month’s box. I was honestly super surprised to like everything, even if they all didn’t fit exactly how I wanted, it was very much in line with what I asked for/my style preferences. Glad you liked it too, Lix! 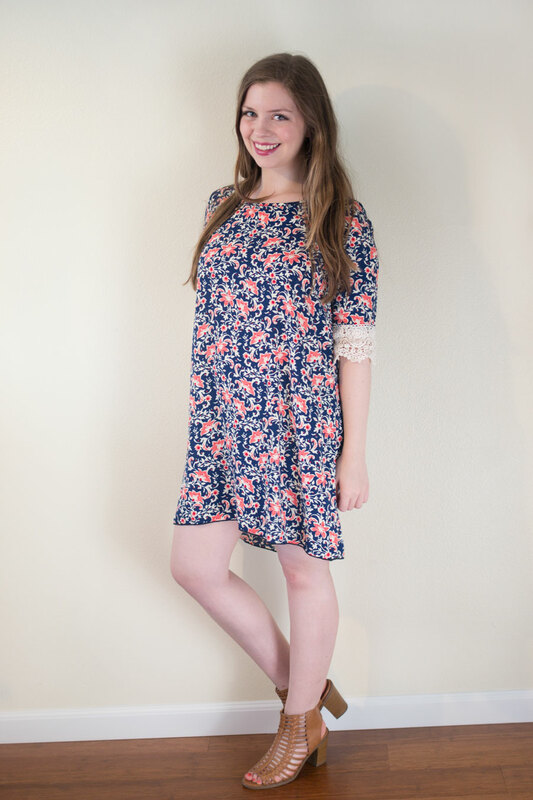 The orange floral shift dress is such a pretty pattern, it’s a shame it didn’t fit right! that sweater is so odd, lol. i feel like, even though i’m tall, it would look awkward on me. i really like that dress on you that is a bit small, the print is super cute! but i also like the other two dresses, that striped one looks fabulous on you! I totally have that striped dress! It looks super cute paired with a jean vest! !